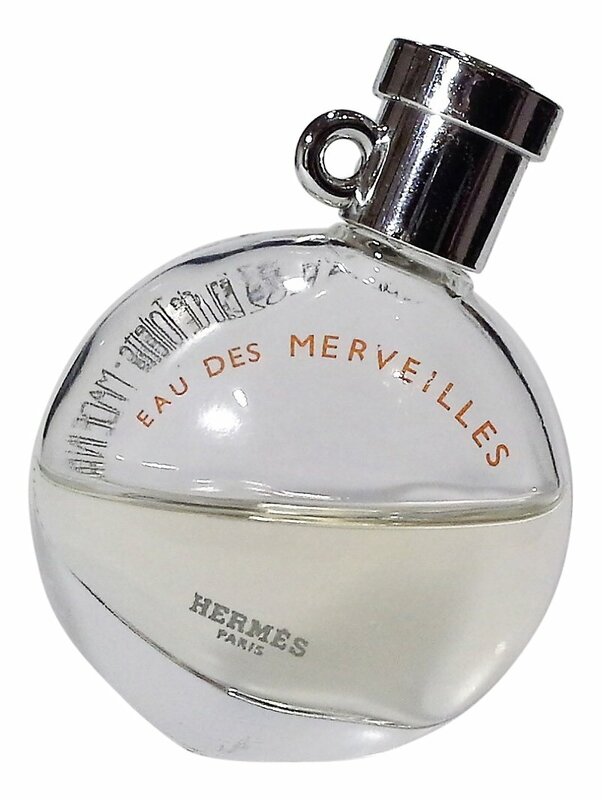 Eau des Merveilles is a popular perfume by Hermès for women and was released in 2004. The scent is spicy-woody. It is still in production. The perfume opens with fresh, sweet citrus, accompanied by sweet spices. It is a fresh, sharp smell. It takes your breath away in a pleasant way. In the middle of the composition there is violet, a sweet one, full of spices. It is a spicy fragrance. St this point I get a soapy smell. The smell is fresh and clean and it gives a sort of purity to the perfume. It is a rich and elegant fragrance, full of spirit and personality. The base is sweeter but it still has a soapy hint. This is a great fragrance for work. It can’t disturb anyone. Is nice, clean, pleasant and elegant. You can’t go wrong with it. Everyone should have in its wardrobe this kind of perfume. Too many samples, too many perfumes I only half like, means I am on a 'use it or lose it' kick (a.k.a. tidying up my perfume stash). This week I tried Eau des Merveilles for the last time; I'm halfway through my second carded sample and won't be finishing the vial. The opening has a zing of juicy lemon loaded with fresh black pepper. A minute or two later a very soapy musk, and a strange velvety wood join the fray. The whole at this stage has a luminous quality. The soapy musk and a strange artificial smelling wood grow ever stronger; I can smell, taste this fragrance everywhere. The scent hangs in the air all day (two sprays from a manufacturer's carded sample) making me feel like I have been smoked in perfume as the smell pours from my hair, my fingernails; its in my nose, my mouth, my clothes; it follows me around and I find it overwhelming. Maybe I am sensitive to certain manufactured aromachemicals but I find this very artificial and suffocating, overly strong, diffusive, pervasive, and tenacious. Eau des Merveilles by Hermès is a lovely fragrance, if not slightly unusual in that it has an upside-down note pyramid! You start out with the woody notes, which Hermès calls the "The Spirit of Wood", consisting of resins, balsams, woods (cedar and oak) and vetiver. Then comes the heart of the fragrance (which Hermès calls "The Memory of the Ocean") consisting of Ambergirs... that wonderful material which comes from the belly of a whale and which smells salty, musky and sweet all at the same time! the perfumer here, Ralf Schwieger, wanted to create a fragrance which centred around this note... and I must admit it smells beautiful! It smells of the sea, with the salty air and also has a musky quality which blends really well on skin, almost like a "second-skin" type of scent. Then finally the dry-down (called "The Sparkle of a Constellation"), a sweet pairing of lemon and orange, followed by a spicy mixture of cardamom, black & pink pepper. This is a very unusual ending for a fragrance, but it somehow lasts a long time on skin, blending really well. My impression is almost like someone sitting on a beach eating an orange. I really like it actually. it's also very unisex (no flowers are involved in the composition), but it is also quite feminine at the same time! Apparently this was the last fragrance made before Jean-Claude Ellena arrived at Hermès (although he later made the flankers to this one, including the Eau de Parfum). I would say that anyone could wear this one, it's a very "happy" fragrance (the name means "Water of Wonders"), and there is something quite happy and magical about it, like fireworks in a bottle. I would say this version (the Eau de Toilette) is perfect for summer and the warmer months, although it could probably be worn at any time of year, but just sitting closer to the skin. Pure sunshine and fireworks in a bottle! If you like casual, happy, but unique or "different" smelling perfumes... then give this one a try! It opens with a blast of Orange. A very happy orange scent! Within fifteen minutes, it settles into a lovely skin scent: sweet, salty, happy. A beautiful scent for any season. It's easy to see why so many people love Hermès EAU DES MERVEILLES. It's citrus without being acidic. It's complex without being complicated. It's simultaneously gorgeous and subtle. It is also completely appropriate for any and every occasion and is fully unisex. The orange scent is less insistent that this house's ORANGE VERTE cologne and concentrée versions. It's also a bit sweeter than those. Rather than a bright green orange, this orange is more ripe but without being sugary. At the same time, there is a decidedly salty quality to this composition. It reminds me of the taste of salt on one's lips after having swimmed in the ocean. Or better yet, imagine pulling up a chair at a beachside cafe for a cold glass of orange juice right after a swim. The saltiness adds just a touch of taste to the orange as it crosses your lips. Another possible comparison might be the salty-sweet quality of kettle corn, although there is no corn scent here whatsoever ... and there is unmistakable orange! The cedar is the most dominant wood scent in this composition, and happily there is no overwhelming blast of aromachemicals here. Sure, there are aromachemicals present, but they are judiciously measured so that the orange and the cedar really do shine through from start to finish. Not only that but they have a sparkly quality, just like the design on the super nice bottle, which is covered with specks of silver, giving off the impression of light. All in all, a quite likable creation, more so than most of the JARDIN series, to my nose. I have to admit, though, that my favorite of this series is the ELIXIR, which is much richer, living up splendidly to its name. Of course, EAU DES MERVEILLES is also well-named, because this really does feel like an eau. In fact, it's perfect for hot weather for that reason, although it can be worn any other time as well. Anyone who is scared off by blindingly bright citrus colognes might want to give this a try to see how else orange can be done. Eau des Merveilles opens quite nice, nicer than I remember in fact. I get a bit of pepper immediately and sweet florals. Pretty for about 15-30 minutes. Then, Eau des Merveilles presents herself as what she is ... a boring, sweet woody. Inverted? Maybe. I'm picking up citrus about 2 hours out, provided that I close my eyes and think real hard. But at this price point, I was expecting a lot more. A lot. I know that Eau des Merveilles is loved in the fragrance community, and perhaps its a good entry point into the Hermes range for many. However, I am a dissenter. On me, EdM is a boring, sweet woody that wears like any dreadful little thing in the mass market. There's plenty of fragrances at a third of the price that already have charted this territory. I generally love Hermes for its uniqueness and it quality, and I own a good handful of full bottles of Hermes scents. I don't believe Eau des Merveilles is among Hermes best work. However, some of the flankers in this are "Must Sample" - the Elixir & L'Ambre, both by JC Ellena, immediately come to mind. Check out the flankers in this line. Eau des Merveilles opens with a beautiful sparkling citrus accord, and after you have tried it, you will recognize that particular and memorable combination of orange and lemon right away. But if you pay close attention to the heart of this fragrance, you can also detect a bit of violet peeping out from behind pink pepper. At last, the cleanest woody base is revealed: vetiver and cedar, with a touch of oakmoss. For me, it is a staple of my fragrance wardrobe I cannot imagine doing without. I challenge you to think of an occasion for which it is not appropriate. I once wore it to a cocktail party, and it so enchanted one of my companions (an eminent scholar in his eighties) that he begged to know what it was. The next day, he bought a bottle for his wife -- or so he says. I have certainly noticed it on him!